For the Suzuki Hayabusa, heat treated chrome moly main bearing studs. These studs feature rolled threads, center-less ground surfaces, and come with competition style twelve point flange nuts. As racing's leading supplier of heavy duty engine stud kits, APE already has their very popular top end cylinder studs for the big Suzuki, and now turned their attention to the bottom end. 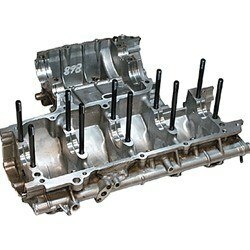 By replacing the bottom end bolts with heavy duty studs, it helps minimize the chances of high output engines trying to separate the engine cases at the crank center line resulting in oil pressure loss and possible engine bearing failure. Hot rodders have already pushed the power of these engines to over twice what the factory intended. As with all engines with this power output, heavy duty fasteners are mandatory to hold them together.